The number one question the New York Islanders will have to handle in the near future is what they plan to do with their goaltending situation. Unfortunately, this is an issue that has a high probability of not being solved by opening night of the 2013-14 season. The Jonathan Bernier situation is the latest example of why this could be a question that will linger longer than Islanders’ fans would like. Jonathan Bernier was the goaltender with arguably the highest upside heading into this offseason. A career 29-20 record with 2.36 GAA in his 3 plus seasons with the Los Angeles Kings, Bernier was never able to overtake the starting job from Jonathan Quick. A 2006 first round pick, Bernier simply fell on bad luck going to a team that drafted a future Conn Smythe winner in the 3rd round of the 2005 draft. With the trade to the Maple Leafs, Bernier should be given a chance to overtake James Reimer for the starting job (pending the 2 sides agree to contract terms). Besides an unlikely draft day move of Bernier, this deal shows that the Leafs have concerns about Reimer’s future and feel that Bernier was worth taking a chance on to become their guy for the future. This was a risk that Islanders’ GM Garth Snow was not willing to take. Garth Snow, above all else, is consistent in the way he handles personnel decisions. There is one overriding theme that has characterized Snow’s last few seasons as GM: he will never overpay for any player. From the crease out, this has been evident the last few seasons of free agency. Sure, it has been a problem luring high end talent to the Nassau Coliseum, but Snow’s approach overshadows this. If Garth wanted a player, the money would have been there to make a move. He has stated in the past that money has never hampered his decision making. Whether you believe him or not is your call. Instead, Snow has decided to stay in house, giving opportunities to Bridgeport callups and staying loyal by giving long term contracts to the core of the team. It was interesting to see how Garth Snow would handle the Bernier situation. Goaltending has always been a horse of a different color, so would Snow apply a different approach? I guess not. Multiple sources had the Islanders in the running for Bernier, but Snow must not have been completely sold on a somewhat still unproven goalie. At first look, it seems that the Islanders could have put together a better package for the Kings than the Leafs, but Snow wasn’t going to go “all in” on a player with only 62 career games. It’s looking more likely that the team will head into training camp next year with the goalies from last year’s roster. There are still a few goaltending options out there (Ray Emery being the most intriguing), but it seems unlikely Garth Snow will be willing to overpay or compromise his current structure following the passing of Jonathan Bernier. With that in mind, here are the most likely candidates to start in net next season. 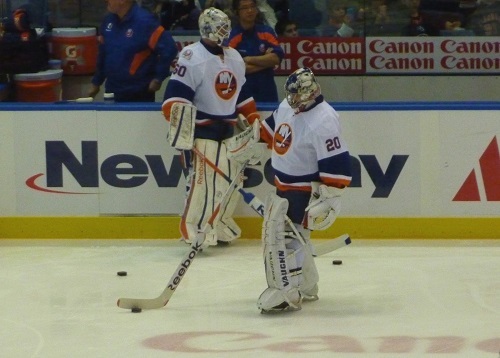 The Islanders’ goaltending tandem for 2013-2014? It’s hard to see Nabokov not returning next season. Even with UFA status starting July 5th, I can’t see Garth Snow letting Nabokov get away. He’s very well respected and a leader in the room. He seems to be the team’s biggest priority. There has been continuous discussion between his agent and the Islanders. The question will be if he gets any other legitimate offers. Not many teams are looking for a starting goalie and there are more enticing options out there as well. If push comes to shove, my gut tells me Snow would put the best offer on the table. If Nabokov wants to be an Islander, I don’t see him going anywhere else. This will surely cause some debate among Isles’ nation. Nabokov’s play last season has come under some scrutiny following a shaky postseason. I continue to disagree with the Evgeni bashing. Sure his best days are behind him, but he was brought into this situation as a place holder. Nabokov was never signed to be the future. He has been nothing short of professional and an absolute upgrade from previous years. I can’t even remember the last time an Islanders’ goalie had a winning percentage better than Nabokov’s 23-11 record this season. Sure he was inconsistent at times, but the Islanders do not make the playoffs without Evgeni Nabokov in net. If Evgeni Nabokov does re-sign with the Islanders this offseason, the main debate with him next year will be workload. It should be seen as a “mentoring” year where Nabokov doesn’t see more than 50 regular season games, with a half season 42 being more optimal. For this to occur, someone will have to take the job, and that will be the million dollar question. 2013-2014 will be a defining year for Kevin Poulin. The 2008 draft pick’s entry level contract expired this summer, and Poulin was recently sent a qualifying offer by the organization. With only 21 career games played, the book has just barely been opened on Poulin, but he will have to prove he belongs in the NHL this year. Still only 22, his career is far from over, but this could be his big, and possibly only, chance to take over the job long term. Nilsson is the wild card heading into training camp next year. The 23 year old will be entering the last year of his entry level contract. The last two years in Bridgeport he’s sported a 23-19 record while sprinkling in 4 games with the big club during the 2011-12 season. There will be no pressure on Nilsson heading into next year. He currently is the only one of the three mentioned here under contract, and it will be interesting to see if he can push Poulin for a roster spot. So who will lead the Islanders into the playoffs next season? This might not be answered at the start of next season, but by January 1st, 2014 there should be a clear answer. A Nabokov/Poulin duo should be enough to keep the team in contention for the first quarter of the season, but if Kevin Poulin’s play is cause for concern, Garth Snow has to pull the trigger at some point next year. If the team is able to put together a playoff caliber first half of the season, Snow owes it to the team’s core to give them a chance in April. Kevin Poulin is or isn’t the guy. If this answer isn’t an emphatic yes come new year, Snow can’t sit on an overworked Evgeni Nabokov to build on the team’s 2013 success.